We will be closed July 4th for the July 4th holiday. Have a fun and safe day! We will be closed July 3rd and 4th for the July 4th holiday. Have a fun and safe day! 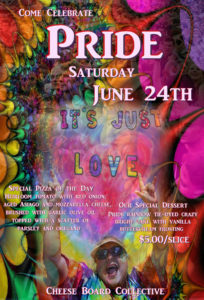 Celebrate Pride at the Pizzeria Saturday June 24th! Celebrate Pride! Graduation season is wrapping up (congratulations grads!) and we are gearing up for pride! It seems especially important this year to mind our history, stand up for what we believe in and celebrate ourselves and each other. Celebrations are going all month long all over the world and we’re feeling inspired! We’ll be serving up a classic vanilla sheet cake bursting with color and decked out in buttercream frosting. Swing by before or after the parade, march and parties to eat with us!